Users can hide fields from the Member Directory directly from their profile. See this article here for more details. Firstly, go to the Settings. Once the page loads, select Member Directory to access specific settings for this section. 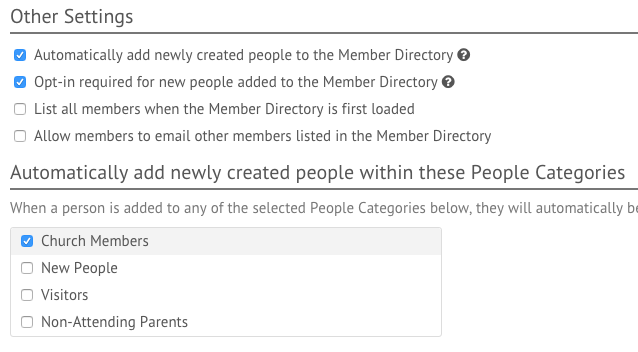 Scroll down to the Other Settings heading select the following settings to automatically send newly created members an email for them to opt-in to the member directory. Please note, the tokens that are sent in these emails only work once, and expire within 2 weeks. If you wish to only send these emails to specific people categories, simply choose what categories these emails go to in the options area that appears below. If opt-in was not enabled prior to adding people to the Member Directory, you can simply hide those people and readd them to the Member Directory in order to re-trigger the opt-in email sent to those people. What about users without a valid email address? For users without a valid email address, we will provide a warning. If you wish to add them regardless of opt-in, press ‘click here’ in the error message. What does ‘Pending Approval’ mean? Users with ‘Pending Approval’ are still considered to be ‘Hidden’ in the Member Directory. This means an opt-in email has been sent to them but they have not clicked to accept. What if my Members don’t yet have Login Details? Select the Demographics you wish to exclude from the member directory will no longer appear. 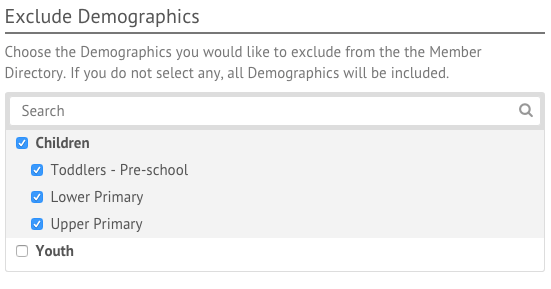 Any member assigned to these demographics will not appear in the member directory.